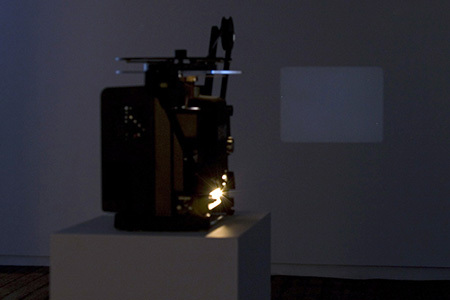 John Michael Boling | Fri Mar 27th, 2009 5:15 p.m.
Thomson’s 16mm film, The Varieties Of Experience, was made by using Nam Jun Paik’s Zen For Film (1962-64) as a negative. Zen for Film consists of a length of clear 16mm film leader projecting a rectangle of pure white. 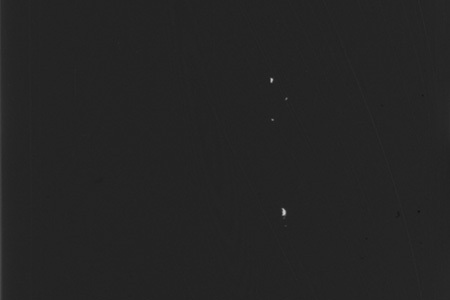 Over time, the celluloid collects dust from the space of its exhibition; this dust is projected as brown and black smudges on the otherwise white image. Dust is largely composed of human cells, and in this way the audience of Paik’s work has literally become embedded in it over several decades. Thomson worked with the NJP estate to procure a “dirty” copy of the film and to use it as a negative from which to make a new print. The new film is an inversion of the original: a black film with the dust printed as white specks and clouds -- a moving starscape, where the stars are composed of dust (and people) instead of the other way around. polarbear_yeti | Mon, Mar 30th, 2009 11:39 a.m. This artwork is quite aptly named. It is a variety of Nam June Paik's original, making total sense. It is also interesting in light of the fact that it is a negative of a video, which I didn't know was even possible. The "Zen For Film" I had heard of, which was intriguing because the dust and particles broke up the white rectangle, creating a highly unique piece. Turning that into a negative and then projecting what looks like a starscape is a great idea. Knowing some of Paik's work and his processes, I think he would rather enjoy this as well. Angela Edwards | Tue, Mar 31st, 2009 12:08 a.m. I had no idea that you could make a negative of a video, either. I also would never have thought of doing it. Not all talent is contained in the finished product; some of the talent is thinking it up in the first place, I would say. blast164 | Wed, Apr 1st, 2009 7:13 p.m.
synaffil | Thu, Apr 2nd, 2009 1:50 a.m.
What an amazing video, I hope there is more to come soon! russmarsha | Sat, Apr 4th, 2009 3:15 p.m. I didnt know either that you can make a negative of a video, very cool. pariswatches111111 | Fri, Apr 10th, 2009 4:05 a.m. I had no idea that you could make a negative of a video, either. I also would never have thought of doing it. pariswatches111111 | Fri, Apr 10th, 2009 4:07 a.m.
contact29 | Sun, Apr 12th, 2009 11:56 a.m.
udit.sawhney | Mon, Apr 13th, 2009 5:40 a.m.
udit.sawhney | Mon, Apr 13th, 2009 5:42 a.m.
icebox.roe1983 | Tue, Apr 14th, 2009 6:34 a.m.
Paik has been given the title of “Father of Video Art,” as he was the first to use video and television as a viable medium. Thomson was inspired by Paik works and this new inventions by Thomson will always been an inspiration of future artists. flashcomponentsnetwork | Mon, Jun 7th, 2010 4:23 p.m.
great information. Congratulation. I have read some video http://www.flashcomponents.net/tutorials_and_articles.html?ref=fcjul tutorials and I am very interested in that. flashcomponentsnetwork | Mon, Jun 7th, 2010 4:25 p.m.
hownow | Thu, Aug 12th, 2010 7:21 a.m.
Edwin VanGorder | Fri, Aug 13th, 2010 6:33 a.m.
1311637684 | Fri, Sep 24th, 2010 11:38 p.m.
1311637684 | Fri, Sep 24th, 2010 11:45 p.m.
Juan Concursos Gratis | Mon, Sep 27th, 2010 4:23 p.m.